AMPARA: The Special Task Force captured another LTTE camp "Janak" and six other camps in Kanchjudichcharu, Ampara last morning, killing four LTTE cadres in a retaliatory attack. Two STF personnel sustained minor injuries, Military spokesman Brigadier Prasad Samarasinghe said. 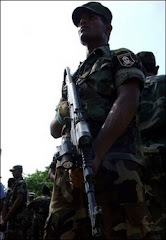 The LTTE cadres fired mortars from the "Janak" camp at STF personnel deployed around the "Stanley Base" which was captured by the STF on Monday, the Brigadier told the Daily News. He said the Stanley Camp was the largest camp of the LTTE in the Ampara district. The "Janak" camp was west of the "Stanley" camp. The capture of "Stanley and "Janak" camps was a strategic victory that would eliminate the terrorist threat posed to Security Forces camps in the East, he added. The "Janak camp' doubled as a large factory where LTTE uniforms were being tailored. "The STF personnel also recovered a haul of weapons, motorcycles and other vehicles from the "Janak" camp," Brigadier Samarasinghe said. According to the Media Centre for National Security, three LTTE cadres surrendered at the Mavedivembu Army road block yesterday morning claiming they were subjected to extreme cruelty by the Tigers. The surrendees are Vijayakumar (23), K. Sadeeshwaran (17) and Rojan (18). "They were abducted by the LTTE and forcefully taken to an LTTE camp in Karadiyanaru for military training," MCNS sources added.